Review: “All This and Gargantua-2,” The Venture Bros.
At the end of last season we had “The Devil’s Grip,” an oddly quiet episode that felt strangely out of place when stacked up against the previous season finales of The Venture Bros.. This show typically likes to go out with a bang…whether that’s in the form of a wedding, the accidental deaths of its title characters, or all out war. “The Devil’s Grip,” by seeming contrast, went out with a firm handshake and some well wishes. It was, to be honest, odd. Perhaps even disappointing, as its place at the very end of the season made it feel like a weaker entry than it really was. 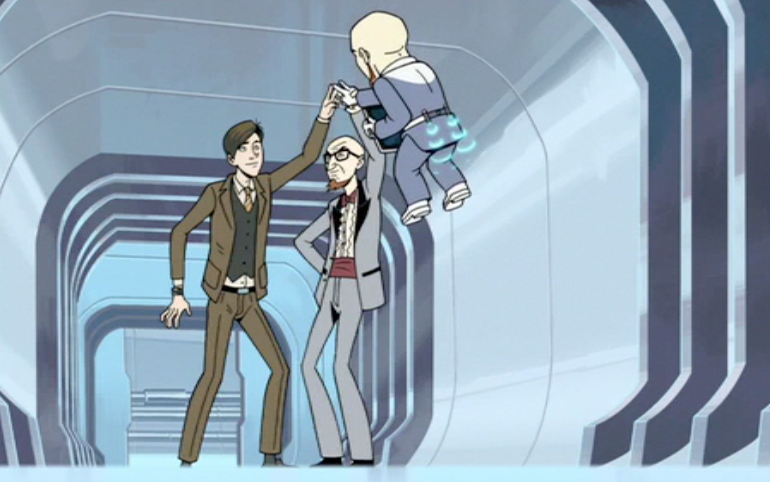 Then again, after season four’s finale — the incredible “Operation P.R.O.M.” — there wasn’t really anything The Venture Bros. could do to top itself. See, “The Devil’s Grip” was never intended as a season finale. It fell that way due to budget and time running out sooner than anticipated. No story concepts, as far as I saw, were leaked, but creators Jackson Publick and Doc Hammer both made it clear that they had a more traditional finale in mind…and just didn’t get to make it. “All This and Gargantua-2” aired last night as a one-off special, but its original role as the “proper” ending of season five is clear, especially since its outcome rests on the ray shield Dr. Venture was building in the season five premiere. The greatest thing about The Venture Bros. is how effectively it manages to evolve its themes rather than abandon or resolve them. It’s an ongoing narrative sleight of hand that at times can feel tiresome — particularly in terms of undone deaths and shifting organizational allegiances — but what it manages to do is make every episode feel like some kind of impressive thematic bookend. Every time the credits roll we don’t just reflect back on the chapter we’ve just seen, but on all of the chapters that came before. What all of the characters have said and done to get us here, exactly here, at this moment. And so while (honorary) Dr. Venture works to fix the ray shield, we aren’t just being reminded of the season premiere. His desperate need for validation from his son stretches back far further than that. It’s never been so clearly articulated (both verbally and non-verbally) before, but it feels like the natural evolution of everything these two characters have been through together. The ray shield ties the event into a larger narrative, but Dr. Venture’s fear that he could very likely die right here and right now without Dean’s respect ties it into a larger theme…one that the show — entering its sixth season — is still managing to explore in fascinating, affecting, tragic ways. It’s also a laugh riot. “All This and Gargantua-2” is a celebration of everything The Venture Bros. has been, and can be, and that’s reflected in both the amount of characters who (shockingly well) manage to share screen time, but also in the writing, which pivots from sharp to heartbreaking to hilarious in ways that even The Simpsons didn’t manage in its prime. I’ll probably need to explain that one, but I’m happy to do so. Though The Simpsons obviously managed sharp / hilarious without breaking a sweat, the show veering into heartbreaking territory always felt like a gear shift. At its best it was a smooth one, but its moments of sadness stand out in part because they were exceptions to the weekly norm. The Venture Bros., by contrast, has a deep and necessary through-line of tragedy. In fact, there may not be a scene in the show’s entire run that can’t be stripped down to a dark and hopeless core. But I don’t mean to elevate The Venture Bros. over The Simpsons and declare it superior. What I do mean to do is spotlight just how unique a show like this is, and just how privileged we should feel for being able to watch it unfold before us. The plot is absolutely conducive to a double-sized episode; Jonas Venture Jr. has finished Gargantua-2, the space station he’s been building for the past couple of seasons, and is now opening it to the public as a kind of gambling resort. The comedy writes itself — a cute “only spies play baccarat” gag is the kind of perfect moment only The Venture Bros. could make work so well and then abandon so neatly — and the stakes (ahem) are clearly high having so many important characters in what we know is going to become hostile territory, but the episode doesn’t rest on comedy or tension, whereas nearly any other show would have. Instead it weaves the comedy and tension into a long-form, multi-directional character piece, and it does so gorgeously. Some of it is the kind of thing we’ve seen before, like Brock taunting his victims and Hank playing hero, but much of it reveals new and interesting angles for these characters. Billy and his mother in particular look set to become a very welcome comic pairing, and Jonas Jr. and General Treister bonding over a certain serious affliction develops into the unexpected emotional highlight of the episode. There’s a great unexplored history between Col. Gentleman and robot-kind that resolves itself when you might not even be paying attention, and some genuinely worrying thinning of the Council of 13. It’s the kind of thing few shows have the chops to pull off, as “All This and Gargantua-2” sets up an epic space battle, but bets its chips on character development and interaction. And it’s exactly the type of episode that makes the sometimes frustrating back-and-forth of the show’s overall narrative feel not only acceptable, but necessary. Whatever it took to get these characters into this situation, with that resolution, it was worth it. There’s also a welcome bit of meta-awareness that becomes actual, in-universe complication: Phantom Limb, at one point in the story, isn’t sure if he’s been double crossed or triple crossed. The audience is often left wondering which side is which side, whether it’s the OSI, SPHINX, the Guild, or, now, the Guild Resistance. When backstabbing characters themselves begin to lose track of whose back is being stabbed by whom, that’s an interesting development indeed, and a reminder that Publick and Hammer are both fully aware of the kinds of tricks they’ve been pulling…which is a necessary condition for resolving it in some way that justifies all the confusion. With “All This and Gargantua-2,” The Venture Bros. remains one of American television’s most pleasant surprises. And as we move on to season six — whenever we move on to season six — we can rest assured that there is still plenty of ground to cover with these characters. Oh, and if you watched the episode, be sure that you’ve also watched the online-exclusive epilogue here. Some big things may have happened aboard Gargantua-2, but there was a lot unfolding on Earth as well. As above, so below. Go, Team Venture. This episode was excellent. I must profess to not liking General Treister (that is his name, right? I can never understand what he says) partly cos he’s boorish and Texan, but also because he seems like such a direct lift of Cotton Hill (Hank Hill’s father in King of the Hill). Not just the voice (and unintelligible dialogue) but the whole demeanor. Like, they lift/parody/homage so much stuff, but that specific one felt wrong. His time in this episode, though, was well done, paying off previous things and becoming quite sweet too. I have to agree, Phil, that the amount of “crossing” happening has become so layered that, like Phantom Limb, I’m a little lost too. But that doesn’t matter too much because the characters are too, and we are experiencing their lives, rather than building towards some predetermined climactic endpoint. Like life, Venture Bros is full of important moments and not-so-important moments, and while sure, the end of each season might have those moments, the characters don’t know what will be important and what won’t be till it happens (and sometimes not till after). I really liked Richard and Sally Impossible in this episode. Not much time shared but they felt so real when they did it was great. Season Six relocating the family looks like it’ll be a neat way to change things up, too. One question though. Can you explain the resolution of the “hating robots” plot you mentioned? I think I must have missed it. Obviously, if Phil does explain, then spoiler warning. SPOILER: a robot carries Colonel Gentleman to safety when everyone is fleeing the casino. Taking this as the culmination of Season 5, I feel safe saying that s.5 was the most thematically consistent one they’ve made so far. There are multiple characters (Brock and 21 come to mind most readily) throughout the whole coming to the realization that the existing “sides” (OSI vs Sphinx/OSI vs. Guild, etc.) are too fluid to matter anymore. (Which is mirrored in the Monarch’s discovery about his and Rusty’s past in the episode previous to this one.) This theme reaches its conclusion in both the Sovereign giving up on the whole thing, and the reveal that some sort of unearthly beings (the Investors) were pulling the strings on both sides the whole time anyway. If it weren’t for the fact that I still want a Monarch/Rusty resolution, as well as the rest of the details on Jonas, Sr.’s death, this would be a pretty great series finale. I’m very excited to see where they go with things in season 6. I think Publick & Hammer like writing themselves into corners in order to grow as writers. See, I saw that. I thought “resolves” meant it told us WHY he hated the robots so much. Although he might have said as much during one of his rants but I just missed it. Ah. It’s entirely possible I missed another part of the resolution for that, then. I always miss two or three things the first time through any Venture Bros. episode. I’m glad I’m not the only one. Partly there’s so much going on. But also, and I hate to say it, I think some of it comes from so few voice actors doing so many voices. It can be hard to differentiate them without going more and more extreme, and some of the more “out-there” voices are hard to catch 100% of. Excellent episode, my favorite part was Killenger dispatching the Investors (his brothers?). The Sith-styled light saber battle was epic, my only wish was that 21 arrived early enough to at least see part of it. I really liked the Investors and had predicted (wrongly) that they were on a collision course with Dr. Morpheus and his Order of the Triad. Maybe the great metaphsyical showdown will be Morpheus vs Killenger ala Gandalf vs Saruman or Potter vs Voldemort, but I digress… This episode was so good that for a hot minute I truly believed that it was the series finale. And I was okay with that since so many danglining issues were resolved. Season Five’s finale was not quite a cliffhanger, but there was much unfinished business and I needed closure. And I think that’s what “All this and Gargnantua 2” did for me, brought me closure. I wrote Morpheus when I meant Orpheus… Matrix on the brain.